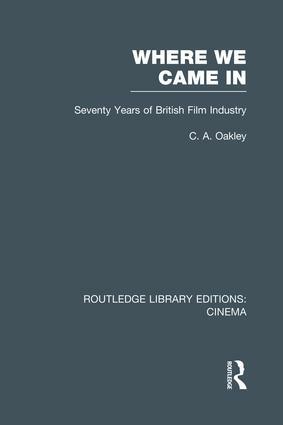 Originally published in 1964, this book tells the history of the British cinematograph industry for the first time. It describes moments of splendid triumph and others of shattering failure. The mood switches from reckless optimism to demoralising pessimism, from years in which British films won the highest international awards to those when they were dismissed with scorn. It recalls a score of productions still ranked among the world's best, and the stars whose reputation was established in them. Attention is focused on the directors, those who kept to the fore during two and three decades and those with only one major success to their name. Behind them the men are identified who strove, often to their considerable financial loss, to gain a worthy place for British films in the world’s markets.